In early October, 26-year-old celebrity, Selena Gomez was reported to have been admitted to hospital because of an ‘emotional breakdown’. It was said she was hospitalized for struggling with depression which started after her kidney transplant in 2017. Since then, Selena has suffered from anxiety, panic attacks and depression. She says it is a side effect of lupus. Then in 2017, the disease returned and attacked Selena’s kidney which required her to have a kidney transplant. Thankfully, she received such an amazing gift from her best friend, Francia Raisa, who selflessly offered Selena one of her kidneys. 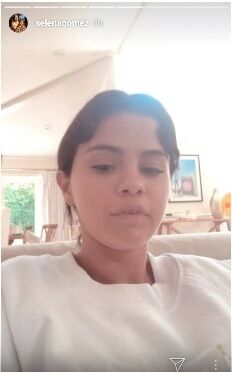 Selena, who is a believer, has been open about her faith in God as well as her mental health struggles. Despite them she has an inner strength to keep going and it seems the lyrics of Lauren Dangle’s song, “This Girl” have touched her greatly. “This girl isn’t going anywhere,” is one of the main lyrics, encouraging us to stand our ground and never give up. Selena surprised her fans recently, with an Instagram story talking about Lauren Daigle, before she admitted herself into the mental health clinic. She urged her fans to listen to this song which is part of Lauren’s newest album “Look Up Child”. Lauren shares how she likes to listen to worship music and the positive feeling it gives her as she sings along. She reveals how “This Girl” has greatly encouraged her in her struggle. She even went on explaining to her fans not to get annoyed with her talking about Lauren’s songs—from the album that has outperformed records from pop star Ariana Grande and rapper Drake. “She’s, like, speaking my language,” Selena said talking about the Christian singer-songwriter, while the song is being played in the background. Lauren Daigle has reached people far and wide with her powerful voice and glorious songs that the world can’t help but listen to. She has made it to the Billboard and with her recent performances on both “The Ellen Show” and “The Tonight Show” she continues to enjoy major success. To see the full version of Selena’s favorite song from Lauren’s newest album, watch the video below.